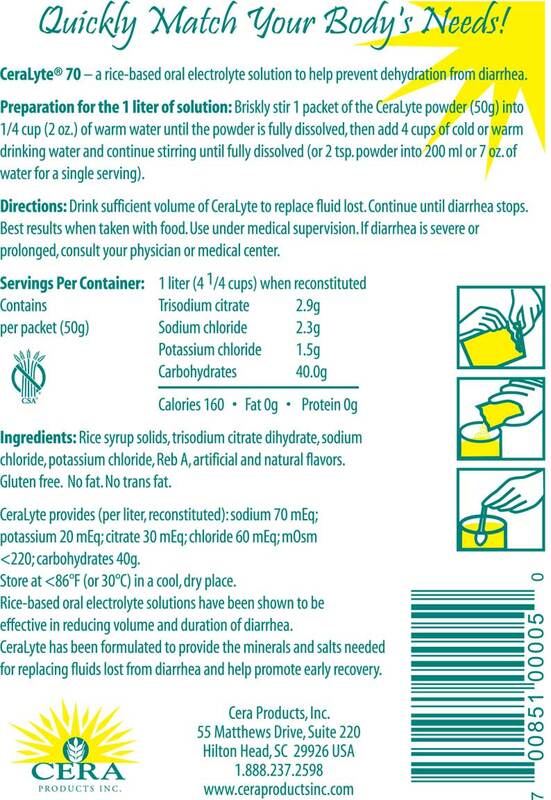 CeraLyte® 70 is for mild to moderate diarrhea and vomiting, to prevent and correct dehydration (in cases with vomiting, it is best to sip small teaspoon amounts) to restore electrolytes and fluid balance. CeraLyte® 70 is available in a ready to drink form (1 liter size) or in powder ( in either 10 gram or 50 gram packets to mix with water). Each 10gram packet makes 7 oz (200 ml) and the 50 gram packets make 34 oz (1 liter) of oral rehydration solution (ORS). So I did not follow the directions. Took a packet and dumped it into a 12oz cold water bottle and shook it. Trying to simulate a quick response to a dehydration event. Well the CeraLyte70 kind of clumped but eventually dissolved. I could barely taste the lemon flavour, just like I had a few drops of real lemon in the bottle. So just fine for what I intend as a dry carry in my advanced kit. If I was buying this as a regular drink for the kids it wouldn't work but good for emergency especial with what they say now about don't drink pure water when dehydrated cause it will deplete electros/minerals/etc even faster.